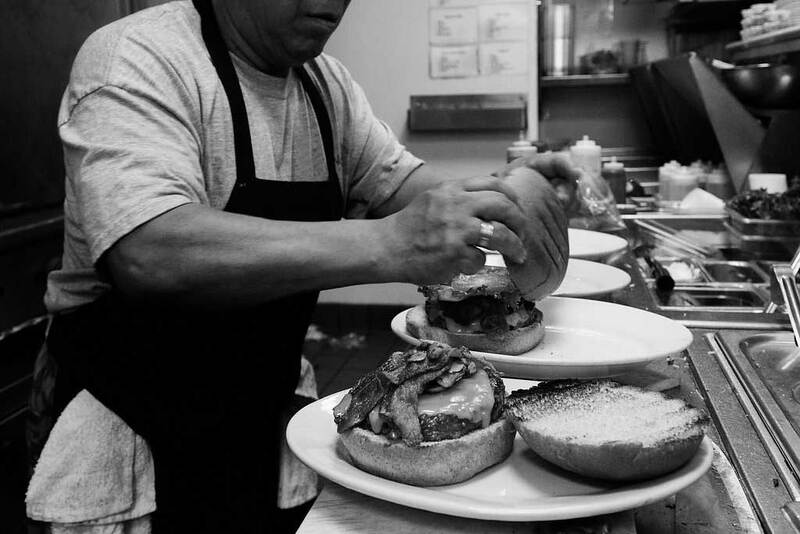 Established in 2007, at Urban Eatz you'll find fresh, quality foods, friendly service, and exceptional value in a warm, comfortable atmosphere. Our fast casual approach and diverse menu cater to both the busy professional and families on the go. We hope you'll agree, there's something on the menu for everyone. Whether you join us for lunch or dinner, take it to go, or have it delivered, we are proud to serve our customers with delicious American fare made with the finest, freshest ingredients. 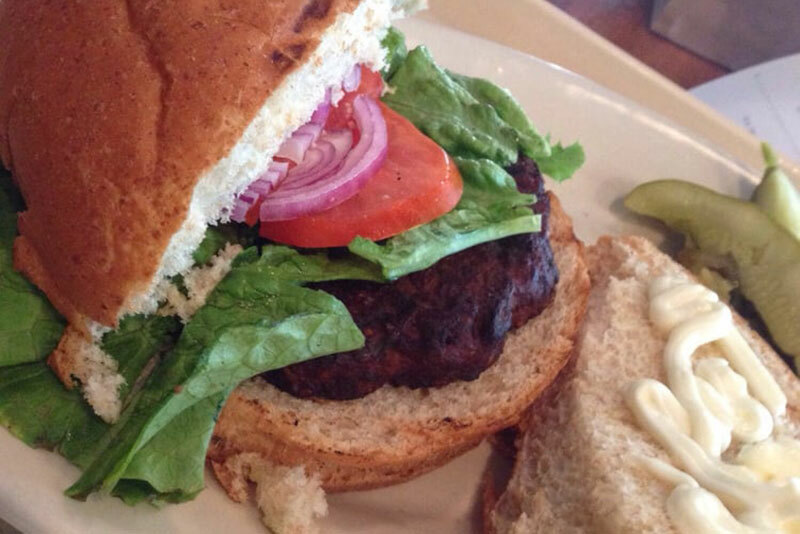 Our Angus beef, natural chicken breast, imported cheeses, fresh produce, and freshly baked breads arrive daily. Urban Eatz is proud to offer homemade salad dressings, soups, pasta sauces, spreads, and turkey burgers that are prepared from scratch in our kitchen. We also offer catering for everything from office lunches to special events. "Something about this place just makes me happy......not sure if it's the quirky atmosphere, the friendly staff or the amazingly unique food and drinks." "Yum! Would definitely go back! Looking forward to trying the dinner menu options!!" "This was my 3rd time at this location and I was NOT disappointed!" "I finally got to try this place after seeing pics and reading reviews. I absolutely LOVED THIS PLACE." Crisp romaine lettuce served with homemade seasoned croutons and freshly shredded parmesan. 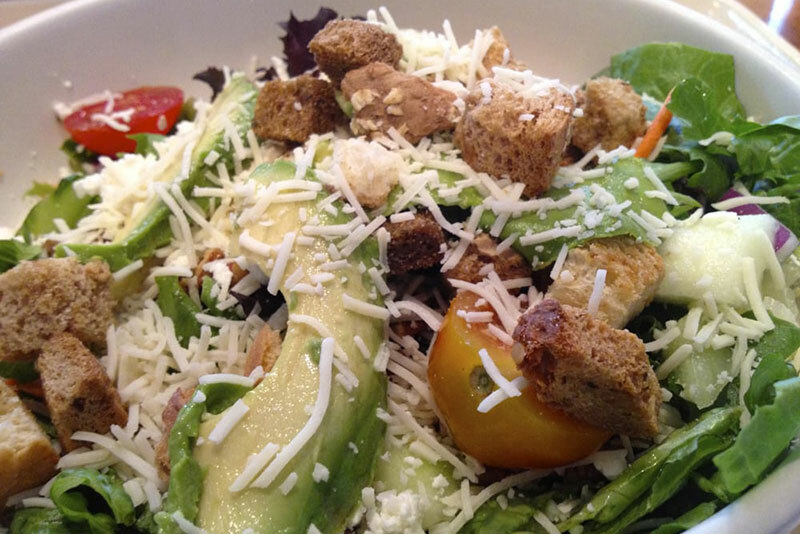 Mixed greens with cherry tomatoes, carrots, red onion, cucumber, feta, parmesan, spiced pecans, and croutons with balsamic vinaigrette. 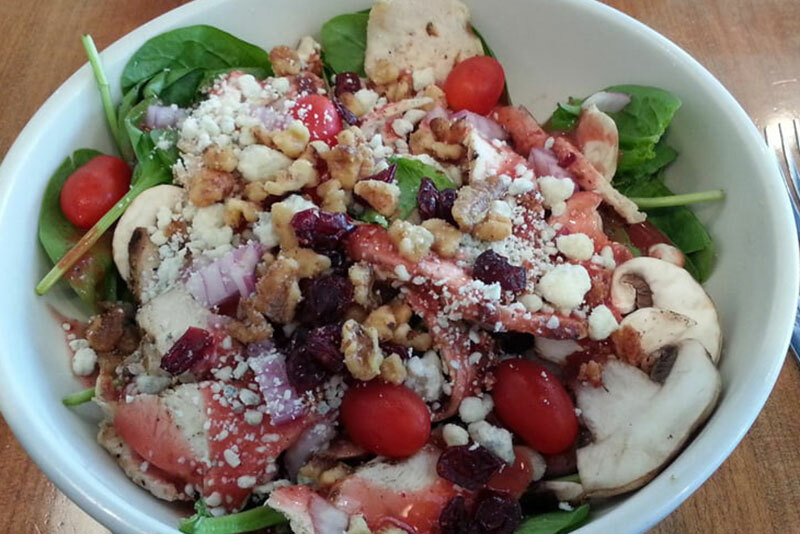 Fresh baby spinach, cherry tomatoes, crumbled bacon, mushrooms, red onion, craisins, candied walnuts, and bleu cheese crumbles tossed with wild raspberry walnut vinaigrette. Our signature salad. 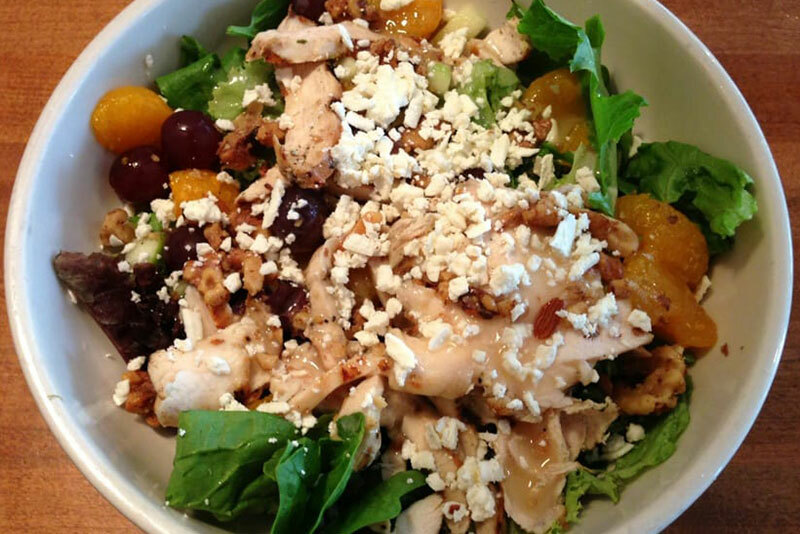 A delicious combination of mixed greens, apples, mandarin oranges, red grapes, candied walnuts, and feta with our sweet maple vinaigrette. Sliced grilled chicken over mixed greens with cherry tomatoes, crumbled bacon, spiced pecans, and parmesan with creamy ranch dressing. 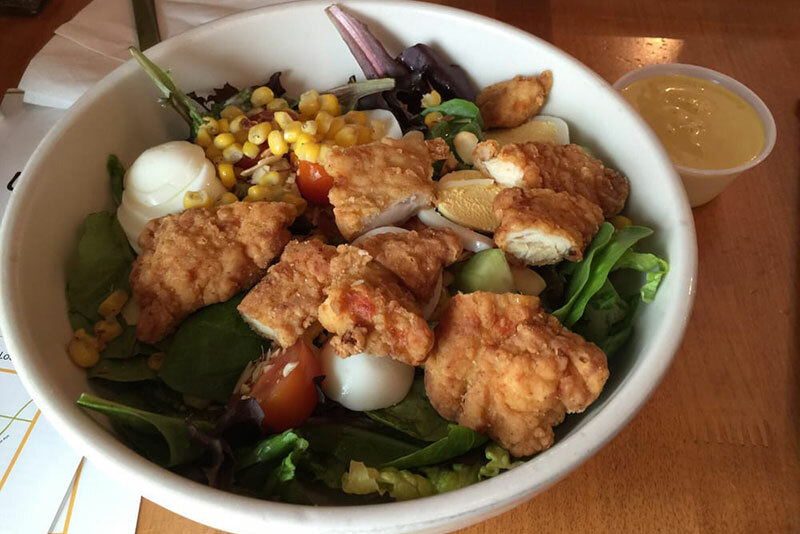 Crisp tenderloins of lightly breaded, deep fried chicken, over mixed greens, cucumber, cherry tomatoes, roasted corn, hard boiled eggs, and toasted almonds with honey mustard dressing. Mixed greens with grilled chicken, avocado, roasted corn, black beans, cherry tomatoes, cucumbers, tortilla strips, and pepper jack cheese with our unique Southwestern vinaigrette. A mix of chopped romaine and julienned broccoli topped with mandarin oranges, carrots, cucumber, green onion, toasted almonds, and crispy garlic wontons with sesame-ginger vinaigrette. Oven roasted turkey breast, Swiss cheese, mayo, tomatoes, and green leaf lettuce on wheat bread. Albacore tuna salad with mayo, lettuce and tomatoes on wheat bread. A delicious blend of grilled chicken, mayo, celery, toasted almonds, craisins, and apples with lettuce and tomato on wheat bread. Tasty, seasoned, slow roasted pork topped with sweet and spicy BBQ sauce, served on toasted ciabatta bread. Oven roasted turkey, Black Forest ham, crisp bacon, cheddar, tomato, lettuce, and mayo on toasted ciabatta bread. This west coast favorite comes with roasted turkey, avocado, tomatoes, Swiss cheese, mixed greens, and our pesto cream cheese spread on toasted ciabatta bread. Served warm on toasted ciabatta bread with roasted tomatoes and red peppers, avocado, grilled zucchini, sautéed mushrooms, provolone, and our pesto cream cheese spread. 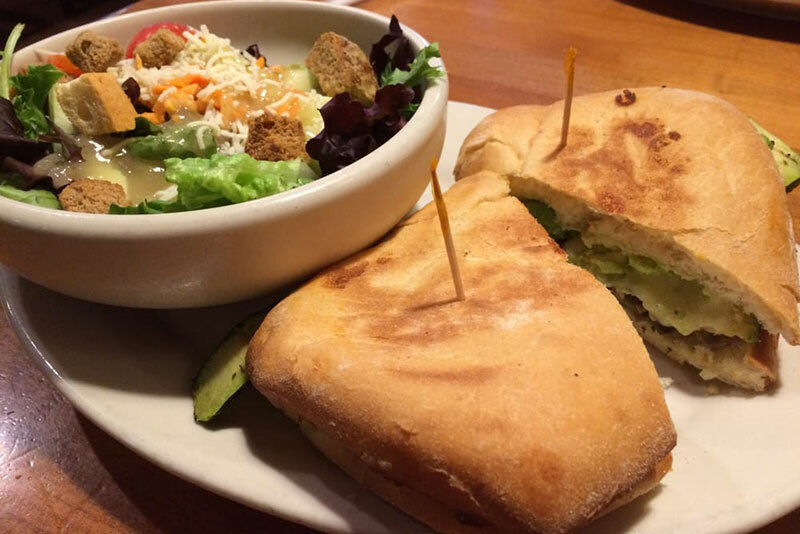 Our signature sandwich. Sliced grilled chicken breast with avocado, roasted tomatoes, Swiss cheese, chipotle mayonnaise, and mixed greens on toasted ciabatta bread. Fresh sautéed mushrooms and melted Swiss. Topped with warmed bleu cheese and crisp bacon. Sweet and spicy BBQ sauce, cheddar, crisp bacon, and grilled onions. Topped with roasted jalapenos and melted cheddar. This one has some kick! Our own turkey patty recipe brushed with olive oil and herbs. Grilled to perfection! arinated tender chicken breast grilled and served on a toasted wheat bun. A delicious alternative grilled and brushed with olive oil and herbs. A crispy fried chicken breast with spicy buffalo sauce, Swiss cheese, lettuce, tomato, and a side of ranch. Fresh tomato sauce, mozzarella and fontina cheeses, with pepperoni and wild mushrooms. Fresh tomato sauce, mozzarella and fontina cheeses, topped with a blend of chopped tomatoes, fresh garlic, herbs, and basil. Fresh tomato sauce, mozzarella and fontina cheeses, with roasted tomatoes, roasted red peppers, wild mushrooms, baby spinach, and red onion. White asiago cream sauce, chicken, baby spinach, tomatoes, and red onion. A Texas favorite! 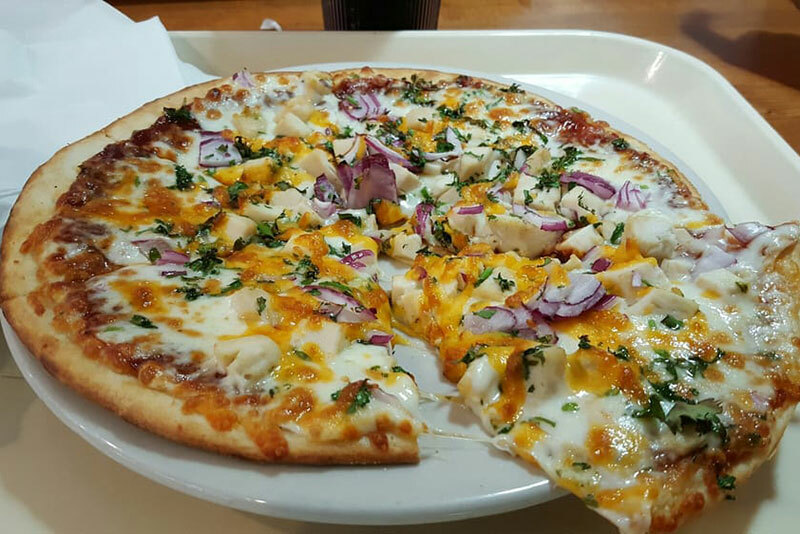 Sweet and spicy BBQ sauce, mozzarella and fontina cheeses, grilled chicken, red onion, cilantro, and cheddar. Fresh tomato sauce, mozzarella and fontina cheeses, with ground beef, roasted red peppers, fresh jalapenos, cheddar cheese, and ranch dressing. Fresh tomato sauce, mozzarella and fontina cheeses, pepperoni, hand pinched, spicy sausage, and crumbled bacon. 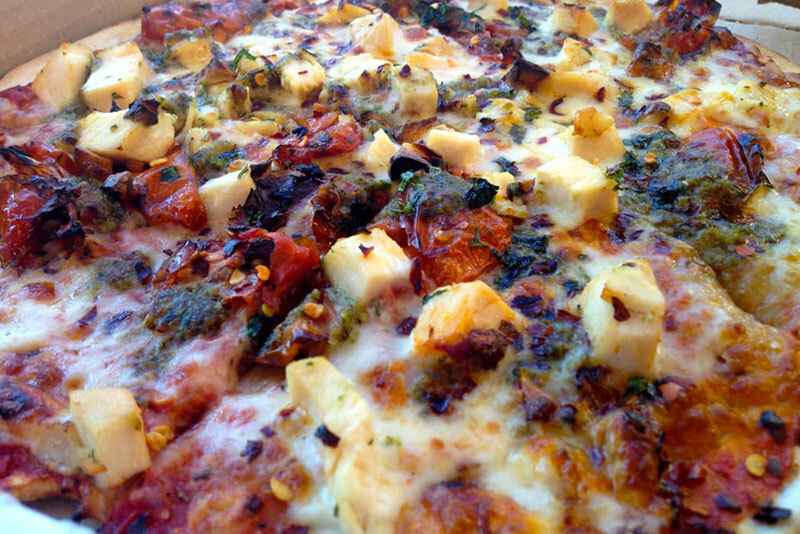 Fresh tomato sauce, mozzarella & fontina cheeses, grilled chicken, roasted tomatoes, cilantro, crushed red pepper, and drizzled with pesto. Topped with parmesan cheese and served with your choice of a side garden salad OR Caesar salad OR garlic bread. A generous portion of homemade lasagna layered with spicy sausage, ground beef, and our house cheese blend topped with marinara. Spaghetti with a classic marinara sauce and hearty meatballs. Grilled chicken breast tossed with bowtie pasta, broccoli, and tomatoes in our homemade mushroom wine cream sauce. Sautéed chicken breast with a lemon butter sauce, mushrooms, capers, and served with angel hair pasta. Grilled chicken breast marinated in fresh herbs and topped with pesto. Served with broccoli, bowtie pasta, and marinara. Penne pasta tossed in our homemade sundried tomato and wild mushroom cream sauce. Angel hair pasta tossed with olive oil, fresh garlic, roasted tomatoes, fresh basil, sautéed mushrooms, and chopped parsley. Penne pasta tossed with a rich, creamy cheese sauce made from a blend of asiago, fontina, bleu cheese, and parmesan. 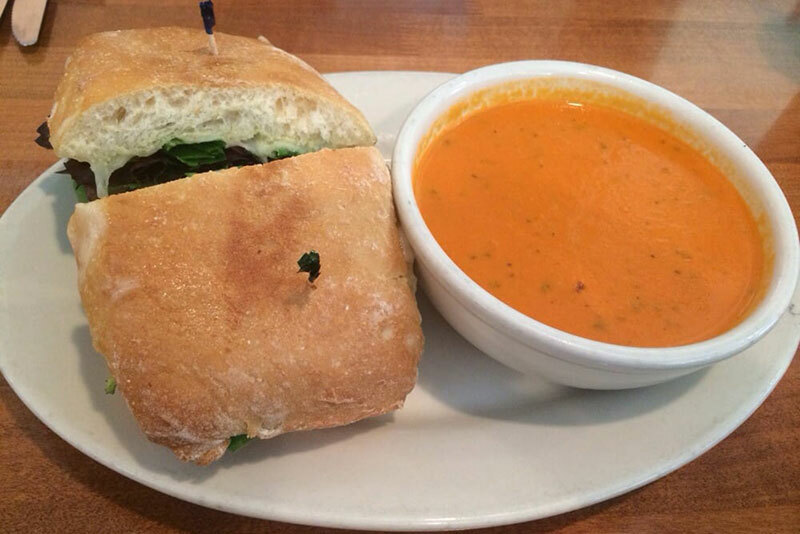 A bowl of our tasty soup and a small Caesar or garden salad.